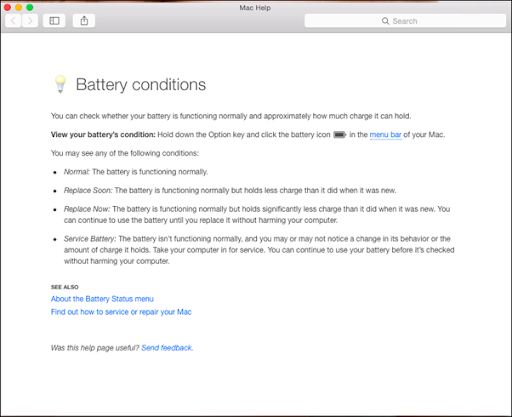 Chronicles of Nushy: Is the battery of our MacBook Air dying? Upon clicking on it, I was directed to an explanation page. So it says that I have to take it for service. Does that mean they are going to fix the battery or will they simply replace it with a new one? I really don't want to put a new battery in this aging laptop; I would sell this and get a new one instead. 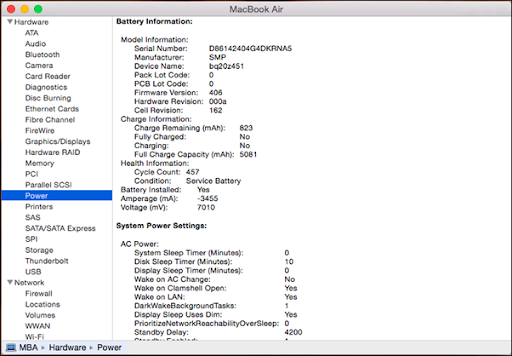 I checked the status of the battery from the System Information utility and this is what I saw. The most important information shown there is the Cycle Count. 457. Which is less than 1000, which Apple says is the number of cycles before the retained charge drops to 80% on their recent MacBooks. Mine is recent enough, right? Some people say that this error only started appearing on their MacBooks after upgrading to Yosemite. In fact, there is a huge thread at Apple forums about this. I cannot make the same claim because I wasn't aware of this message until now. It could have been there even before Yosemite or after upgrading to it. This might not be the battery after all. Intel's System Management Controller (SMC for short) could be reporting inaccurate information. There is a way to reset it, but it involves taking the battery off. Yikes! Is it even possible with a MacBook Air? There indeed are screws underneath. But I'm not comfortable I opening it up. I wonder how much they would charge if I took it to an Apple Store and got it done through them. Guess I will have to call then and see. Maybe I could contact them via email. Maybe there is something I could do as well: perform a clean installation of Yosemite. I've never clean installed OSX. This laptop came with OSX Lion and I've upgraded it to Mountain Lion, Mavericks and Yosemite. I cannot imagine doing that on Windows. I guess it is only possible on OSX because it is basically the same thing underneath. I’ll do a clean install tonight and let you know how things work out. Hold on tight until then, folks. Hoping to reveal good news.